On Saturday afternoon, January 30, 2016, The Cotuit Library hosted a talk entitled "The Sky Show" for the general public presented by Barnstable High School astronomy teacher, Michael Gyra and one of his students, Albert Brox III. The presentation started with Mr. Gyra showing a PowerPoint presentation displaying impressive pictures of occasional stargazing and observing sessions he and his astronomy students put on at Sandy Neck beach located in Sandwich, Massachusetts. Mike also displayed a series of astronomical slides and shared interesting facts about them. A few that stuck out was the distance of astronomical objects and the gravitational lensing. One of Mike's former students, Kevin Harrington is graduating from Umass with a double major in Astronomy and Neuroscience. Kevin was part of a team who identified 8 new sources (early galaxies) through gravitational lensing. Cobb Astro Park - Photo by Mike Gyra. What I found to be the most impressive part of the talk was what Mike and a team of others accomplished on the campus of Barnstable High School. The center courtyard at the High School was a forgotten space for many years, overgrown with weeds and basically ignored. Over the span of 11 years, since 2004, Mike and his team (as well as help from students) transformed the courtyard into the Cobb Astro Park. The park features gardens, murals, mosaics, marble sculptures, a labyrinth, and an observatory. The park has an unmistakably Greek Esque decor, with Doric columns all around its perimeter, an amphitheater, statues of Poseidon and The Winged Victory, an interactive sundial and murals depicting the Parthenon and astronomical constellations. David B. Cole Observatory - Photo by Mike Gyra. Located at the center of the park is the David B. Cole Observatory, which features a retractable roof, computer control room, and houses a Celestron 14" telescope equipped with a CCD camera system for imaging celestial objects. This brought us to the last part of the presentation. Mike's student, Albert, took over the lecture to display his collection of images of deep-sky objects he had taken through the observatory's telescope. 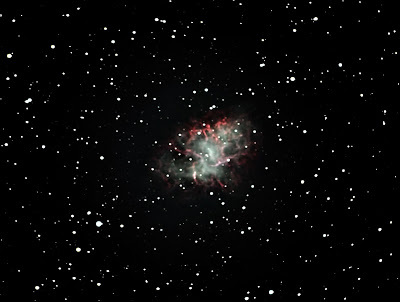 Albert Brox III, a sophomore at the high school had imaged deep-sky objects M42 - The "Great Orion Nebula", M13 - The "Great Hercules Globular Cluster, and my personal favorite of his images, M1 - The "Crab Nebula" in the constellation of Taurus, a supernova remnant from a supernova first recorded by Chinese astronomers in AD 1054. Albert acquired and processed all of the images himself with astronomy imaging processing software such as MaximDL and Gimp. 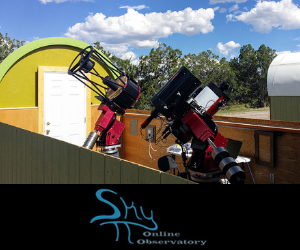 The amazing part of this story is that Albert has only been imaging for a little over half a year since the observatory became operational in July of 2015. 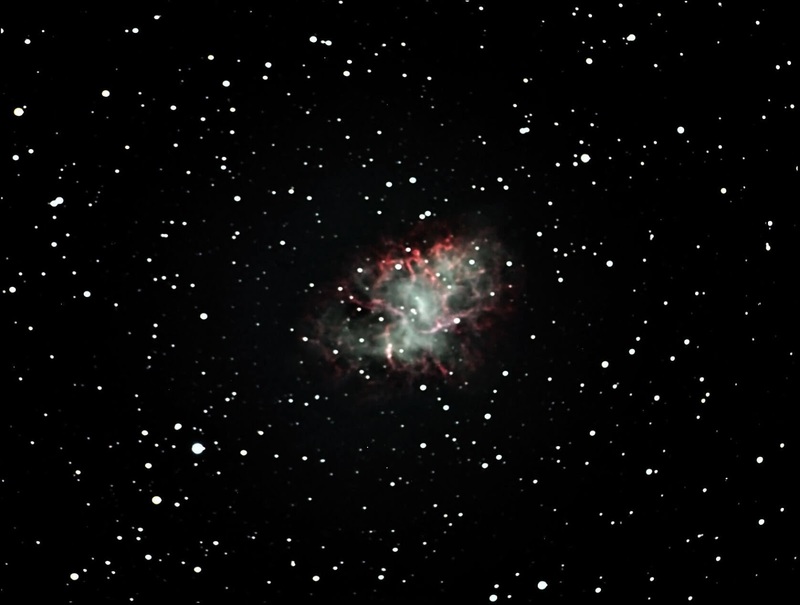 M1 - The "Crab Nebula" Imaged by Albert Brox III. I was fortunate to meet and speak with Mr. Gyra and Mr. Brox after the talk about their accomplishments and how inspiring they were and how nice it was to hear of a high school participating in great depth with astronomy education. Mike and I also discussed a plan about Insight Observatory and Barnstable High School collaborating on astronomy projects with his astronomy classes for the next school year. A sincere thank you to Mr. Gyra and Mr. Brox for sharing their interests and passion for astronomy with the public. 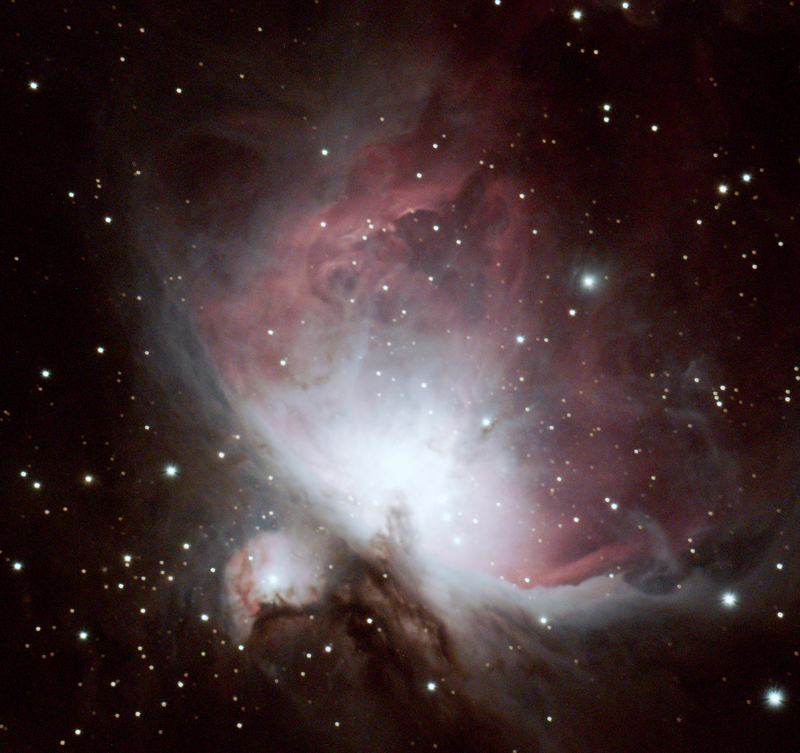 Also, a special thank you to the Cotuit Library for their continuing series of talks on the subject of astronomy.